Well, that’s made me feel a bit better, but it’s probably made you feel worse. I’m sorry about that, but at the moment you’re the only one I can really put everything straight to. Perhaps I shouldn't send this, just carry on typing until I’ve got it out of my system, and then destroy it? I’ve had a couple of meals at the Centre the last two lunch times – quite reasonable dinners at not too bad prices, so that would seem to help. And saves me fiddling around till 7 at night cooking a big meal when I get home. Not that I mind, I bought myself a little book called the No Time to Cookbook, and it’s already come in handy. It has recipes for meals that take 10, 20 and 30 minutes so is quite good because they’re all fairly filling. Some are a bit expensive, however, so I’ll stick to the cheaper ones. Did I tell you I gave the Crowls some chocs last time I was there; I’ll see if I can get some flowers for Mavis this time. This will be the last weekend for a couple as they’re going on holiday. There have been two or 3 things I’ve meant to say for ages and keep forgetting. First I must apologise on my bended knees for being so rude to you on the day I left – I know I’m always a bit shirty on that sort of occasion, but I seemed to be extra nasty that day. I am really sorry. Next to mention the little old houses that we saw going into Rome (! ): several of them had little niches up in the wall and there would be a statue of Our Lady standing in them. Similarly in London there are odd little statues hanging on buildings or sitting in some unexpected corner. Very few religious ones of course, but occasionally I’ve seen a crucifix or somesuch hanging over a door. And last night I saw the second of two quite absurd accidents: a taxi was standing in the middle of Plaistow High St, with another car pulled up behind it, when a bloke in a little sports model pulled out from across the street (I think) and quite happily ran into the back of the car! I don’t suppose he was too happy about it really, but it just seemed too silly to have happened. No one hurt. And another day this week a fellow who one minute was parked at the side of the street came suddenly shooting down and into the back of another parked car. I don’t know whether his brakes suddenly failed or what! And another titbit. There is a little man with a moustache doing a buskers act outside one of the Piccadilly Circus theatres each time I go past. he has a couple of people playing for him and sings and dances without a sign of strain, and he’s not all that young, either. On Tuesday I joined the Nat. Film Theatre, which since it works out to something like a penny a day seems quite reasonable. Plus the fact that you get a lot of free guff as well as free copies of Sight and Sound, the big Brit. film mag. 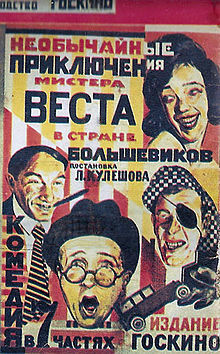 I also went in and saw something called [The Extraordinary Adventures of] Mr West in the Land ofthe Bolsheviks, a silent film which was extremely funny in a goon-show way. Mr West is an American senator who goes to Russia (complete with cowboy protection!) and gets involved with a gang who do him out of all his dollars. On Wed, I went to the Meistersingers which cost a pound, which is a lot. I could have perhaps got in for less but it would have meant a killing evening’s sitting: the show starts at 5.15 and goes till 11.30!! So I got a slightly better seat, and a marvellous view, and still didn’t have anywhere to put my feet!! None of the London theatres think about this apparently. But it was worth it. There are two breaks, one of 15 minutes and another of 45. Over a 100 in the orch, and more on stage. Fantastic. Last night, because the Opera Centre got half price seats I went to a concert at the Royal Festival Hall. And even though it’s a new hall, there’s nowhere to put your feet! We got the cheapest seats, and they were still excellent. It’s a great place: 3 huge floors all fronted by glass, looking out over the Thames. They played my favourite Mozart Concerto, outstandingly, and two Beethoven bits. [Not at all informative; I don’t now know what my ‘favourite’ Mozart Concerto was.] London is still small: the boy next to me was a NZer (so he said to his girlfriend!) and Gerald Krug, one of the Aussie Conductors during last year’s little trip of mine, was there with his wife. At least I’m sure it was him. He didn’t seem to recollect me when I sort of kept wandering around them at the interval, so I didn’t speak in case it wasn’t; but I’m sure it was! People here don’t seem to expect to see anyone they know. Going to Reg’s last week, there were three Americans on the tube [handwritten from this point on] who stayed on when I got off. They turned up at St Alban’s Cathedral. I wasn’t greatly surprised but the Crowls seemed to be! – when I told them, that is. I’d better go and do some work and have some breakfast etc. An awful lot of love – Milke (who?) Mike.